Sifting through public status updates posted on Twitter and Facebook can be quite useful for instantly tapping into people’s thoughts on any given topic and links to more information about it. But sometimes it’s even more useful to search only the status updates published by your friends and family, like when you’re looking for something specific to your social circle or only want to get an overview of thoughts or recommendations from those people you know and trust. 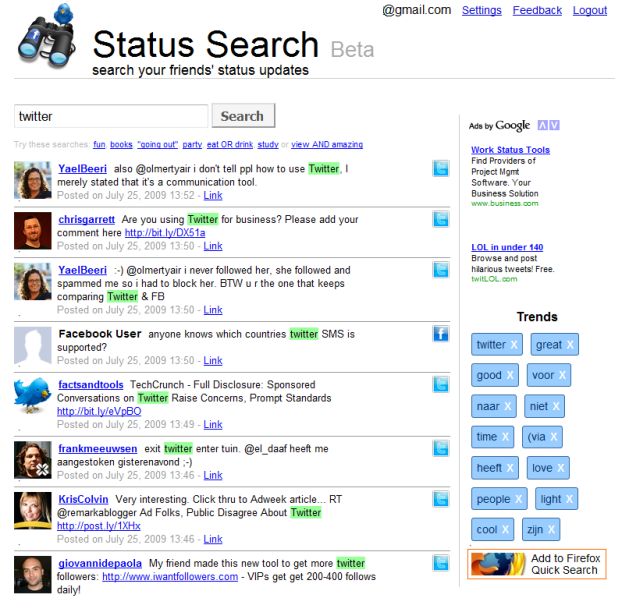 Enter Status Search, which aims to fill that particular void in real-time search. Once registered for this service, brought to you by Elad Meidar and Lior Levin, you can authorize it to gain access to what your circle of connections on both Twitter and Facebook is saying without the need to enter your credentials for said social networks. Basically, it’s what you can accomplish by searching FriendFeed updates from your friends but without the need for them to actually register for that service. Firefox users can enable a quick-search plugin for Status Search inside the browser, which takes away the hassle of having to remember to visit their website to search. I tested a couple of search queries and the results were satisfactory, although I’m not sure exactly how far the index goes back. What I particularly liked was the fact that the trending topics that are displayed in the sidebar are generated from the stream of messages originating from the people you know and not the herd. In the past, I’ve called out for this type of implementation because Twitter’s trending topics have simply lost their appeal from the early days now that the service has gone mainstream. Also nice: an alerts system that enables you to track specific words or phrases that you would like to get notified about. You can choose to receive an unlimited amount of e-mails on these terms, delivered either immediately or on a daily basis. From what I can gather from the Status Search website, the alerts are currently free of charge but there are apparently plans to start charging as much as $10/ month per word at some point (which is ridiculously expensive if you ask me).